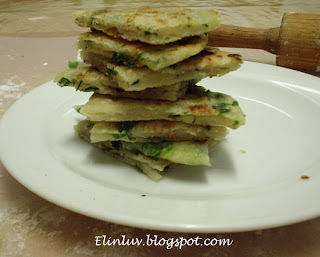 Would you believe it , if I tell you that I woke up at 4.50am this morning just to prepare this Scallion Pancakes for our breakfast? :) Yea, I did just that. I couldn’t believe myself too, that I actually woke up that early just to prepare this pancake for breakfast. And the time taken to take photos of the whole process of making this pancake hmmm….. Daddy will lecture me on this when he reads this post of mine later. “ Crazy ” he would say, but since he had a share in eating , I guess his lips will be sealed after tucking in those warm pancakes and a cuppa of hot Nescafe !!! 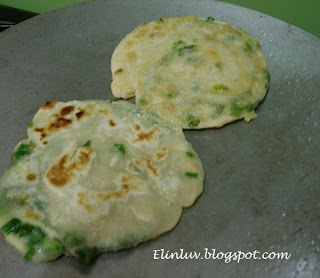 vegetable oil or vegetable shortening (shortening will give you a slightly flakier pancake). 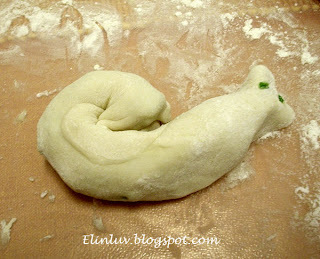 Start off by making your dough. 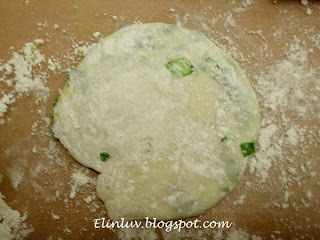 I do it in a food processor because it is easier but you could just as easily do it by hand. 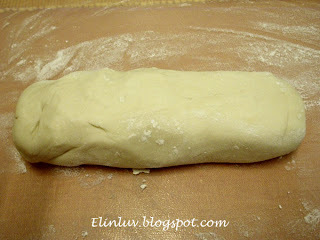 Start off by adding 1/2 cup of warm water to the flour and incorporating well. 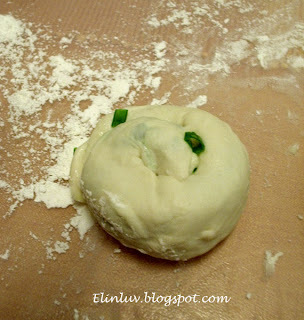 Gradually add water in teaspoon increments until the dough is pliable and easily comes off the sides of the bowl. You want the dough to be just barely sticky, but not rock-hard. 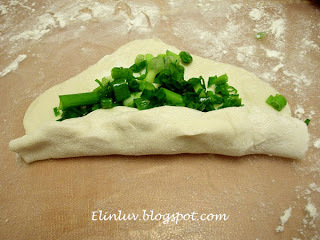 Cover with a damp tea towel and let sit for 30 minutes so the dough can relax. 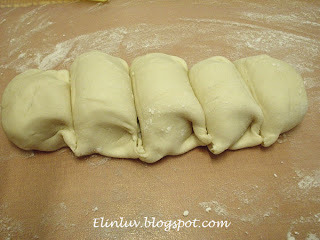 Next, roll the dough out with your hands into a semblance of a log, and divide into 5 pieces. Take one piece out and cover what you're not using. 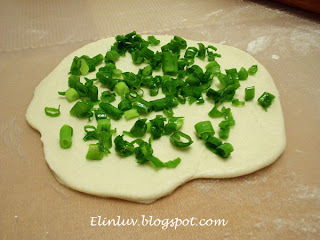 Roll it out into a round about 6 or 7” across, then brush with oil or shortening, sprinkle liberally with kosher salt and plenty of scallions (the more, the better!). Pick up one end of the round and begin rolling it into a tight little cigar. Pinch the ends of the cigar to seal them, and then twist the dough around itself until it forms a spiral. 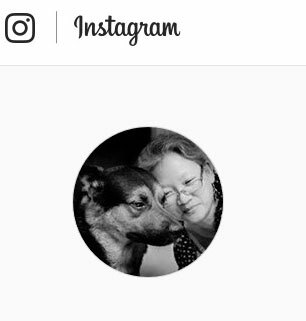 Press this down. Roll this out again into 7” round. Don't go too thin, otherwise all the layers will smoosh together. 1/8" thickness should do. Heat up a non-stick or cast iron pan on medium heat, and add enough oil to generously cover the bottom of the pan. Oil = crispiness, which is what we want. Don't skimp! When the oil is hot enough so that a small piece of dough starts sizzling immediately after being added, throw in one of your pancakes. Cook for about 3 - 4 minutes a side, turning over when it's golden brown. Drain the cooked pancake on a paper towel, and slice into wedges when you're ready to serve. These are great by themselves, but you can also mix up a little sauce of soy sauce, rice vinegar and ginger if you'd like. :) what to do, when desire rules the heart. Your family is lucky to have you.